In a traditional classroom environment, instructor enthusiasm has been shown to enhance student’s emotion, affective perceptions, intrinsic motivation, and cognitive outcome. Additionally, emotional response theory argues that enthusiastic verbal and nonverbal cues of an instructor will induce positive emotional states in learners, which in turn, enact learners’ approach behaviours in the learning process. Therefore, should a pedagogical agent convey enthusiastic behaviours in a multimedia learning environment? Literature and theoretical reviews offer two competing views. The first view, based on emotional response theory, predicts that enthusiastic verbal and nonverbal cues of a pedagogical agent can induce higher positive emotions in learners, which in turn, enhance affective perceptions, intrinsic motivation, and cognitive outcome. However, the second view, based on cognitive load theory, suggests that pedagogical agent enthusiasm may increase extraneous cognitive load (additional processing in the mind), which negatively impact emotion, affective perceptions, intrinsic motivation, and cognitive outcome. 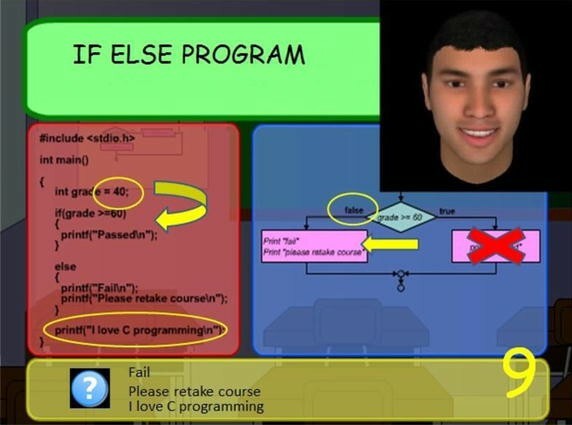 To investigate the effects of agent enthusiasm, seventy-two university freshmen interacted with either an enthusiastic agent or a neutral agent (operationalized through vocal tones, facial expression, gestures, and remarks) that simulates the instructional role of a virtual tutor that delivers narrative demonstrations on how to predict the outputs of C-Programming algorithms. The results of our study showed that pedagogical agent enthusiasm significantly enhanced emotion, intrinsic motivation, affective perceptions, and cognitive outcome. Moreover, mediation analyses revealed that the facilitating effects of agent enthusiasm on intrinsic motivation, affective perceptions of the learning environment, and affective perceptions of the pedagogical agent were fully mediated by a learner’s positive emotion, thus demonstrating that the framework of emotional response theory can be applied to learner-agent interaction in a multimedia learning environment. Implications and suggestions for future research related to pedagogical agent enthusiasm are discussed in this paper. Pedagogical agents are animated characters that are embedded in virtual learning environments. Derived as an extension of intelligent tutoring systems [1, 2], they are seen as potential tools to create a social presence that primes learners to deeply process the learning material (social agency theory, [1, 2]). The social agency theory is supported by findings of a recent meta-analysis; it was revealed that learners achieved more from multimedia learning system with a pedagogical agent than a system without an agent (see for a review ). Advances in multimedia have allowed pedagogical agents to express synthetic emotions and nonverbal behaviours . Hence, these advances open up a myriad of potential social learning benefits, due to the simulated socio-emotive relationships between learners and computer agents [5, 6]. Research has also shown that pedagogical agents should emulate human-like qualities, such that an agent voice should be narrated by a human voice rather than a computer-synthesized voice [7, 8]. However, beyond this fact, research related to agent’s teaching and instructional styles is still scant . For instance, in traditional classroom settings, instructor enthusiasm is often perceived as one of the significant conditions for effectual instruction and for student motivation . Hence, should pedagogical agents act enthusiastically and passionately about a particular subject? Can pedagogical agents transfer enthusiasm to students and improve their perceptions of and attitudes toward the subject being taught and the agent itself? In a paper by Johnson et al. , the authors suggested that conveying enthusiasm is one of the main purposes of implementing pedagogical agents. It was hoped that an “…emotive pedagogical agent may convey enthusiasm for the subject matter and thereby foster similar levels of enthusiasm in the learner” . In terms of agent design, Baylor and Kim  operationalized an agent’s displayed enthusiasm through its voice, facial expression, and dialogue. Specifically, the researchers endowed a learning companion agent with enthusiastic behaviours, such as expressive and animated facial movements, and energetic vocal tone, in order to motivate students in computer-based learning environment. Agent enthusiasm is also operationalized through an agent’s feedback and responses to a leaner’s input. For instance, COSMO the pedagogical agent was designed to show enthusiasm by providing congratulatory remarks and applause whenever a question was answered correctly by learners . Another pedagogical agent, Coach Mike, which was designed to act as guide, companion, and motivator, conveyed enthusiasm through body animation and utterances to congratulate and encourage learning effort . Although pedagogical agents can potentially transfer enthusiasm to learners in multimedia learning environments , there is a surprising lack of empirical evidence to support this claim. Indeed, prior studies have provided the conceptual and operational aspects of pedagogical agent enthusiasm [10–12]; however, since there were no comparisons made between enthusiastic agents and control agents in these studies, therefore the effects of agent enthusiasm on emotion, motivation, and cognition are not clearly understood. Furthermore, at this juncture, we note that there are a number of theoretical issues related to agent enthusiasm that require further scrutiny. For instance, on the one hand, detractors of agent enthusiasm may argue that exaggerated nonverbal cues by an enthusiastic agent may distract learners from salient learning [13–16]. Under this view, enthusiastic pedagogical agents may be detrimental to cognitive and emotional outcomes in learning by imposing additional processing burden to a learner’s mind, which is known as “extraneous cognitive load”. On the other hand, the socio agency view of pedagogical agents [2, 3, 5, 7, 10, 11] suggests that an agent-based learning system has the potential to fulfil social and emotional aspects of the learning process in an otherwise cold and impersonal learning environment. Extending this notion, emotional response theory [17–19] argues that enthusiastic cues of an instructor may induce positive emotions in learners, which in turn, enact approach behaviours in the learning process. Hence, in the context of a multimedia learning environment, it can be argued that displayed enthusiasm by a pedagogical agent may foster similar levels of positive emotion (or enthusiasm) in the learners, thereby enhancing motivation and cognitive outcome in multimedia learning environments. Hence, to shed more light on this issue, we aimed to explore the effects of agent enthusiasm in a multimedia learning environment that delivers a lesson on programming algorithm. To this end, the main research question that drives the overall direction of this study is: How does a pedagogical agent’s instructional style (enthusiastic versus neutral verbal and nonverbal cues) affect emotion, intrinsic motivation, affective perceptions, extraneous cognitive load, and cognitive outcome in a multimedia learning environment? To answer this research question, we analysed data from an experiment in which seventy-two university freshmen were paired either with a neutral agent (control) or an enthusiastic agent (experimental). The general definition of “enthusiasm” in educational settings can be categorized into two aspects . The first aspect of enthusiasm describes a teaching delivery that is “stimulating, energetic and motivating” [20, 21]. The second aspect of enthusiasm refers to the subjective experience of instructors themselves in terms of enthusiasm for teaching . Because pedagogical agents do not possess real emotions, the concept of agent enthusiasm is limited to the first aspect, that is, an agent’s instructional style. In the context of instructional style in traditional classrooms, enthusiasm relates to the teaching delivery that conveys the significance and intrinsic value of learning or of the subject’s content to learners [22, 23]. An instructor may convey enthusiasm through verbal cues, such as remarking on the value of the learning material or expressing instructor’s own interest in the matter . More importantly however, enthusiasm is also conveyed through enthusiastic nonverbal cues such as highly animated gestures, dynamic and energetic vocal tones and smiling facial expressions [20, 24]. The effects of enthusiastic verbal and nonverbal cues of an instructor on the students’ learning processes can be discussed through the lens of emotional response theory [17–19]. In this theory, researchers have highlighted the pivotal role of a learner’s emotional state [17, 18]. Specifically, the theory explicated three aspects: (1) nonverbal communications, (2) learner’s emotional feedback, and (3) learner’s approach-avoidance behaviours. There is a strong relationship between verbal and nonverbal cues of instructional communications and emotional responses in learners, as humans are predisposed to perceive and react to the emotional tones in a speaker’s verbal and nonverbal message. In fact, people are more likely to be emotionally influenced by a sender’s non-verbal cues, such as facial expressions, vocal expressions, and gestures, rather than verbal messages . According to the emotional response theory, emotional states will affect learners’ tendencies to approach or avoid the subject or instructor during the learning process. Mehrabian  asserts that people are drawn toward persons and things they like, evaluate highly, and prefer; and they avoid or move away from things they dislike, evaluate negatively, or do not prefer. Hence, if the verbal and nonverbal cues of an instructor induce positive emotions, a learner would enact approach behaviours in terms of learning. In contrast, if verbal and nonverbal cues reduce the feelings of positive emotions, therefore, a student would enact avoidance behaviours. Hence, enthusiastic gestures and animated movements project an image of liveliness, interest, and dynamic, which in turn, leads to positive emotional responses in learners [17–19, 24]. In the context of instructional settings, Richmond and McCroskey  established a set of nonverbal cues that affect immediacy in the student–teacher relationship: appearance, facial expression, vocal expression, gestures and movements, space, touch, scent, and environment. For the purpose of this study, only the nonverbal cues that are the most relevant in a learner–pedagogical agent interaction are discussed. Firstly, the appearance of the teacher/agent plays an important role in influencing immediacy. Richmond and McCroskey  suggest that a teacher who dresses casually invites perceptions of friendliness and openness, whereas a teacher who is formally dressed may be perceived as unreceptive. Moreover, psychological biases, such as the halo effect and similarity–attraction, will affect perceptions of immediacy. The more attractive a speaker is, the more likely he or she will be automatically perceived as competent, trustworthy, and approachable. Also, students may be more likely to be attracted and attentive to teachers whose characteristics and attributes are similar to their own. Facial and vocal expressions are factors that influence perceptions of affinity. A smiling facial expression projects an image of liking, affiliation, and immediacy. In contrast, a glum or expressionless face projects an image of disinterest and boredom toward students and the learning subject. Regarding the characteristics of voice, students equate a teacher’s monotonous voice with an image of uncaring, disinterest, and boredom. On the other hand, lively, animated vocal expressions are favoured by students, as they promote interest and immediacy in student–teacher relationships. Finally, affinity and immediacy between teachers and students are influenced by gestures and movements. Richmond and McCroskey  notes that head nods stimulate positive social and emotional responses from students. In contrast, a teacher who rarely nods impedes student–teacher immediacy. A speaker’s expressive gestures and animated movements project an image of liveliness, interest, and dynamic, which in turn, leads to positive emotional responses toward the speaker and the subject. On the other hand, a non-animated speaker may be perceived as dull and uninterested in the students and the subject matter. Cognitive outcome (i.e., learning gain measured by post-tests or perceived learning). Affective perceptions refer to students’ attitudes, beliefs, and values about a subject matter or teacher . Previous research indicates that students’ affective learning is positively related to positive verbal and nonverbal cues of instructional communication [17–19, 22–24]. Affective perceptions have important implications to multimedia learning. Positive and negative emotions are related to how learners evaluate their experience in the multimedia learning environment, which affect learners’ willingness to actively engage with the learning systems [27–29]. Intrinsic motivation could be defined as “enjoyment-driven motivation”, characterised by an experience of pleasure, a display of curiosity or interest and subjective perceptions of self-determination . Isen and Reeve  states that “intrinsic motivation is the motivation to engage in a task for its own sake—out of interest and/or enjoyment—and not as a means to another reward”. In a paper by , it was shown that instructor enthusiasm was the most powerful unique predictor of students’ intrinsic motivation and vitality. Through the manipulation of instructor enthusiasm (high vs. low), it was demonstrated that students who received an enthusiastically delivered lecture subsequently reported greater intrinsic motivation regarding the lecture material and experienced higher levels of vitality. It has been proposed that heightened emotional responses such as arousal and positive valence, will likely to enhance intrinsic motivation [17, 18, 31]. In the context of multimedia learning environments, empirical research has demonstrated that induced positive emotions increases intrinsic motivation in learners [29, 30, 33, 34]. Emotional states in learners can impact the cognitive aspects of learning. Kelley and Gorham  conducted an experiment in which students were asked to quickly recall lists of items. Students who had a nonverbally enthusiastic teacher had increased short-term recall, and thus, exhibited a positive relationship between immediacy and cognitive learning. Kelley and Gorham argued that enthusiastic nonverbal cues induce higher emotional arousal in learners, which in turn, led to higher cognitive activation and alertness when focusing and recalling information. Furthermore, research has shown that an arousing, emotionally-charged message will be more likely to persuade and dominate conscious processing in people . Positive emotion can promote flexibility and efficiency of thinking and problem solving . In his seminal work on the emotional design of products, Norman  notes that a positive mood causes the brain to relax and be more receptive to curiosity, creativity, and effective learning, while a negative mood causes the mind to focus narrowly on the problem. Based on the aforementioned discussion, it can therefore be hypothesized that enthusiastic verbal and nonverbal cues of a pedagogical agent can induce positive emotions in learners, which then direct their approach behaviours in the learning process. In the context of a multimedia learning environment, induced positive emotion has been shown to increase learners’ intrinsic motivations, affective perceptions of learning environments, and cognitive learning outcomes [29, 30, 33, 34]. There are a few empirical studies that support the facilitating effects of displayed enthusiasm by computer agents. For example, an enthusiastic voice has been shown to increase a user’s intrinsic motivation to interact with a virtual learning system . Furthermore, a recent study has shown that enthusiastic narrative style of a computer had a positive impact on listener’s recall rate, besides emotion and intrinsic motivation . In the context of instructional design of multimedia learning system, the cognitive load theory must be observed. The cognitive load theory states that learners have limited working memory while processing new information . Miller  highlighted that the working memory can only hold seven (plus or minus two) chunks of information at a given period. This limitation is further signified during the processing information stage. Depending on the complexity of the learning materials, learners can only store two or three information chunks when processing (organizing, contrasting, and comparing) them. Also, the newly acquired information will be lost from working memory within 15–30 s, if they are not rehearsed. One underlying assumption in cognitive load theory is the existence of knowledge structure known as schema. Learning in this context requires a change in the schematic structures of long term memory. The learning performance is indicated by how well learners are able to efficiently process the schema in working memory (e.g. learner becomes increasingly familiar with the material). Novice learners haven’t acquired the schemas of an expert. This assumption has been observed in experiments involving multimedia. Studies showed that novice and expert learners respond differently to multimedia presentation. Related to the process of multimedia learning, three types of load are defined- germane, intrinsic, and extraneous. Germane load relates to mental effort that learners dedicate during the learning process when presented with learning materials. Intrinsic cognitive load is the inherent difficulty depending on the type of multimedia instructions . For example, the intrinsic load for mathematical formula of subtraction is lighter than the intrinsic load for mathematical formula of algebra. Extraneous load pertains to the format presentation of the information that cause learners to use additional mental resources to process them. Designers should try to minimize the extraneous load by paying attention to how learning can be optimized through effective design . Based on the theoretical positions outlined earlier, it is therefore instructive to look at the relationship between pedagogical agent and cognitive load. As mentioned previously, the cognitive load theory states that learners have limited working memory while processing new information . Thus, the cognitive load view asserts that agent nonverbal cues may distract learners from salient learning materials [13–16]. Specifically, distractions arise as learners have to pay attention to the nonverbal cues of an agent, which then cause visual and cognitive interferences during the learning process. As noted by Schroeder et al. , “further work could be done to examine how the cognitive load caused by agents differs over time and in respect to different agent features such as voice, appearance, and gestures”. Hence, in the context of this research, it is plausible that agent enthusiasm may impose additional processing burden, also known as, extraneous cognitive load on working memory, because learners have to attend to exaggerated nonverbal cues by an enthusiastic virtual agent. In other words, learners are forced to split their attention between the agent’s numerous visual elements (i.e., exaggerated gestures and facial expressions) and other information in a multimedia learning interface (i.e., text and diagrams). Findings from certain empirical studies beheld agent’s verbal and nonverbal cues as distractions to multimedia learning. For instance, some learners reported that they were distracted by the eye and head animation of Laura, a virtual tutor that teaches Spanish . Another study showed that non-task messages conveyed by a pedagogical agent distracted learners away from the main learning content . Lastly, it was shown that the social appeal (i.e., similarity attraction effect) of a pedagogical agent “seduced” learners away from salient information . Additionally, exaggerated behavioural cues by an enthusiastic agent may also elicit negative emotional responses in learners . When an agent exhibits a high amount of verbal and nonverbal cues, it produces an illusion of superior functionality and intelligence. Because learners form unrealistic expectations regarding the agent’s functionality and intelligence, frustration and disappointment may occur when these expectations were not met. Ironically, even when an agent fulfils a learner’s expectations of realism, the strong human-like impressions by the agent may induce emotional disturbance in learners, due to “uncanny valley effect” [47, 48]. Furthermore, agent’s nonverbal expressions such as smiling and dynamic gestures are sometimes perceived as “fake” and “pretentious” . For example, our earlier research showed that learners’ emotional, motivational, and perception outcomes were negatively affected when there was a mismatch between pedagogical agent’s affective voice tone and facial expression . The review of these studies paints a cautionary assessment of agent enthusiasm in a multimedia learning environment. For instance, for an agent to display enthusiasm, a high degree of animation (i.e., facial and body cues) must entail. Furthermore, an enthusiastic agent must include superfluous dialogue, such as remarking on the value of the learning material and expressing its own interest in the subject. Moreover, an enthusiastic agent may automatically increase its social appeal, which in turn seduce learners away from learning materials. Lastly, an enthusiastic agent may induce negative emotions in learners, due to the uncanny valley effect and its over-portrayal of intelligence. Taken together, these factors may cause agent enthusiasm to negatively affect the process of multimedia learning. The objective of this paper was to explore the effects of agent enthusiasm in a multimedia learning environment that delivers a lesson on programming algorithm. Based on the emotional response theory, verbal and nonverbal cues of an enthusiastic pedagogical agent can affect the levels of positive emotions in learners, which in turn, direct their approach-avoidance behaviours (intrinsic motivation, affective perceptions and cognitive outcomes in the learning process). However, a contrasting view, which is based on cognitive load theory, posit that enthusiastic verbal and nonverbal cues of a pedagogical agent can increase extraneous cognitive load in learners, which in turn negatively affect their intrinsic motivation, affective perceptions, and cognitive outcomes in the learning process. In order to empirically investigate all of these possibilities, the resulting research model was formed (Fig. 1). Seventy-two freshmen (37 males, 35 females, mean age = 19) at an Asian private university were recruited to participate in the study. In an effort to generate a sample of novice learners, through interviews, we ascertained that all participants had no prior knowledge in programming-related subjects. However, the participants had taken the subject of basic computer applications; hence, they were suitably proficient in computer usage. Two 3D male pedagogical agents (i.e., talking heads) were designed to convey either enthusiastic or neutral behaviours. The agents were designed to simulate the role of a virtual tutor, which deliver a step-by-step demonstrative instruction on how to predict the output of a given algorithm. The audio speech of both agents was recorded from a professional voice actor. For the enthusiastic agent, the emotional tone of the voice conveys enthusiasm, while the emotional tone of the neutral agent was calm and pleasant (i.e., newsreader presentation style). The neutral agent was also designed to maintain a neutral expression and offers low number of gestures. In contrast, the enthusiastic agent was designed to constantly smile, express a high level of animated head movement, and nod his head while speaking. Additionally, the enthusiastic agent provided enthusiastic remarks such as “I love programming” and “this is an interesting topic”. These manipulations were in line with enthusiasm parameters framework found in . Table 1 shows the design factors for enthusiastic and neutral agent. A pilot study was conducted to assess the validity of the manipulation of pedagogical agents. Students (n = 47, mean age = 20.2) from an Asian private university were recruited and randomly assigned to either the enthusiastic agent or the neutral agent. A 7-point Likert survey asked participants to assess the agent enthusiasm (items: energetic, excited, enthusiastic, active, lively; Cronbach’s alpha = .956). Results from the independent-samples t test showed that participants in the enthusiastic agent condition (M = 6.44, SD = 2.7) gave a significantly higher agent enthusiasm (average of the 5 items), compared to participants in the neutral agent condition (M = 3.12, SD = 2.9), t(45) = 3.199, p = .000. The multimedia learning environment served as an interactive platform for the pedagogical agent to deliver a lesson on C programming (see Fig. 2). Participants were required to learn to comprehend algorithms and predict the outputs from C statements—(1) IF statement, (2) IF-ELSE statement, and (3) NESTED-IF statement. Within the virtual learning environment, participants first needed to study the fundamental program concepts, such as initial value, condition, and statement. To be able to predict program outputs, participants must form correct mental models on program algorithms by grasping the relationship between the initial value, condition, and statement. Sample programs and flowcharts were included to highlight these relationships, and subsequent working demonstrations were presented to show how to predict the program output. The ability to identify programming concepts and to predict program outputs are consistent with the cognitive skills of knowledge retention and comprehension of Bloom’s taxonomy in computer sciences . To quantify the level of positive emotion in learners, the positive affect scale (PAS) from PANAS was utilized . This survey has been formerly used in studies that examine emotional responses to interface design in the multimedia learning environment [33, 34]. The survey asked respondents to indicate the degree to which they experienced 10 types of positive feelings, using a 5-point Likert-type scale ranging from 1 (very slightly or not at all) to 5 (very much; coefficient alpha = .84). The total score for positive affect was obtained by adding the 10 responses from the items (Cronbach’s alpha = .953). The learner’s intrinsic motivation was measured using a self-report instrument, consisting of an 8-item questionnaire with 7-point Likert style items, developed by Isen and Reeve  for measuring intrinsic motivation. Participants were asked to rate how interesting and enjoyable they found the experience (1 strongly disagree, 7 strongly agree). One point was assigned for each item, and each participant’s total score, obtained by adding responses from the 8 items, was used for the data analysis (Cronbach’s alpha = .911). This survey has been used in studies related to multimedia learning environment [33, 34]. A survey with a scale ranging from 1 (strongly disagree) to 7 (strongly agree) measured each learner’s perception of the virtual lesson. The survey consisted of two items: (1) the virtual learning environment is enjoyable, and (2) I am willing to come back to the virtual lesson in the future (Cronbach’s alpha = .872). A second measurement, to determine a learner’s perception regarding virtual agents, had a scale from 1 (strongly disagree) to 7 (strongly agree). This measurement consisted of five items: (1) I like Michael (the virtual avatar); (2) Michael is knowledgeable; (3) Michael is friendly; (4) I can trust Michael; and (5) I am willing to learn with Michael in the future (Cronbach’s alpha = .883). To measure the extraneous cognitive load experienced by learners, participants completed a 7-point Likert style survey on their subjective perceptions of task difficulty . The learning performance of participants was measured as a total score of the comprehension post-tests. The comprehension test asked learners to predict the output of ten short algorithm program statements. Specifically, out of the ten questions, three questions were related to IF Statement, four questions were related to IF-ELSE Statement, and the remaining three questions were related to NESTED-IF statement. For each correct output of the algorithm program statement, one mark was awarded, hence the maximum score obtainable was 10. These measures were consistent with the cognitive skills of knowledge retention and comprehension in computer sciences. The participants (n = 72) were randomly divided and ushered into either one of two identically designed laboratories, thereby forming the enthusiastic pedagogical agent group (n = 38) or the neutral pedagogical agent group (n = 34). Next, participants interacted pedagogical agents in a 20-min multimedia presentation. There were three intervals within the multimedia presentation; at each interval, computer-based instructions were given to participants to complete the Positive Affect survey (PAS) for measuring learners’ positive emotion. After the virtual lesson, participants were instructed to complete the surveys for measuring intrinsic motivation, perception of the agent, and perception of the virtual learning environment, and extraneous cognitive load. They were then given 20 min to complete the comprehension post-test. Using a scoring rubric, each learner’s post-test outcome was scored blind with respect to experimental conditions by one of the authors of this study. To compare the effects of enthusiastic versus neutral agent on dependent variables, a series of independent-samples t tests were conducted using IBM SPSS Statistics 23. To assess the potential mediating factors (i.e., positive emotion and perceived cognitive load), we used Preacher and Hayes’s indirect bootstrapping method . All the results were considered significant at a p value of <.05. An independent-samples t test was conducted to compare the average scores of the PAS between participants in enthusiastic agent and neutral agent conditions. Results show that participants experienced significantly more positive emotion when paired with the enthusiastic virtual agent (M = 34.5, SD = 9.91) than when paired with the neutral virtual agent (M = 28.6, SD = 10.54), t(70) = 2.411, p = .019. The magnitude of the differences in the means (eta squared = .076) was between moderate to high (as proposed by Cohen, ). By comparing the three PAS scores at each interval, we are able to track the changes in the positive emotion of learners during the learning process (see Table 2; Fig. 3). For the enthusiastic agent group, one-way repeated measures ANOVA showed no significant differences among the PAS scores, Wilks’ Lambda = .985, F(2, 36) = .272, p = .763, multivariate partial eta squared = .015. However, for the neutral agent group, there was a significant effect for PAS scores, Wilks’ Lambda = .566, F(2, 36) = 12.275, p = .000, multivariate partial eta squared = .434. Subsequent paired-sampled t-tests showed that PAS 1 scores decreased significantly, compared to PAS 2 scores, t(33) = 4.75, p = .000, while scores for PAS 2 and PAS 3 did not differ significantly, t(33) = .631, p = .532. Pairwise comparisons between the enthusiastic agent group and neutral agent group showed significant differences for PAS 2, t(70) = 2.759, p = .007, and PAS 3, t(70) = 2.759, p = .006. When we compare learners’ responses in the intrinsic motivation survey, the independent-samples t test showed a significant effect, t(70) = 2.482, p = .007, between the enthusiastic agent and neutral agent group. It was revealed that learners interacting with the enthusiastic agent reported significantly higher intrinsic motivation (M = 29.1, SD = 9.4) than learners interacting with the neutral agent (M = 23.0, SD = 8.9). Results from the independent-samples t test showed that learners in the enthusiastic agent condition (M = 7.0, SD = 2.5) reported a significantly better perception of the learning environment, compared to learners in the neutral agent condition (M = 5.1, SD = 2.5), t(70) = 3.178, p = .002. A series of independent samples t-tests were conducted to compare learner perception regarding the agent’s likeability, knowledge, credibility, friendliness, willingness to learn from agent, and total scores of the perceptions. Table 3 shows the descriptive results for learners’ perceptions of the pedagogical agent. Results from the independent samples t tests comparing the enthusiastic agent and neutral agent revealed significant effects for perceived agent friendliness, t(70) = 2.574, p = .012; learners’ willingness to learn from the agent again, t(70) = 2.578, p = .012; and total agent perception, t(58.58) = 2.161, p = .035. Notably, learners in the enthusiastic agent group gave significantly higher ratings for agent friendliness, willingness to learn from the agent, and total agent perception, in comparison to learners in the neutral agent group. There were no significant differences for agent likeability, knowledge, and credibility between the groups. Results from the independent samples t-test showed that there was no significant difference between the enthusiastic agent group (M = 3.6, SD = 1.5) and the neutral agent group (M = 3.8, SD = 1.8) for extraneous cognitive load, t(70) = .55, p = .58. Hence, the hypothesis that enthusiastic agent can distract learning by imposing extraneous cognitive load was not supported in our study. Cognitive outcome was measured as the total scores obtained from comprehension post-tests. Results from the independent samples t-test showed that learners who interacted with the enthusiastic agent (M = 5.8, SD = 3.4) significantly outperformed learners who interacted with the neutral agent (M = 3.7, SD = 3.4), t(69.164) = 2.592, p = .012. The emotional response theory [17–19] proposes that the teacher’s (agent’s) verbal and nonverbal cues affect a learner’s emotion, which in turn, mediates approach–avoidance behaviours, such as intrinsic motivation, perceptions of the learning environment, perceptions of the agent, and cognitive outcomes. To explore positive emotion through the mediator hypothesis, a series of mediation analyses using Preacher and Hayes’s indirect bootstrapping method  was conducted to assess the role of positive emotion as a mediator between an agent’s instructional style (neutral versus enthusiastic verbal and nonverbal cues) and learning behaviours (i.e., intrinsic motivation, learning environment perception, agent perception, and cognitive outcome). For the purpose of standardized presentation and reporting of coefficients, the conditions of agent instructional style were dummy-coded (0 neutral, 1 enthusiastic) and the values of intrinsic motivation, learning environment perception, agent perception, and cognitive outcome were averaged by the number of items of each construct. To test whether a learner’s positive emotion (i.e., average score of PAS) played a mediating role between an agent’s enthusiasm and a learner’s intrinsic motivation, we conducted multiple regression analyses to assess each of the variables. Results showed that an agent’s enthusiasm significantly correlated with a learner’s intrinsic motivation, B = .62, t(70) = .7529, p = .0069. It was also shown that an agent’s instructional style was significantly correlated with a learner’s positive emotion, B = .5816, t(70) = 2.41, p = .0185. Finally, there was also a significant correlation between a learner’s positive emotion (as proposed mediator) and a learner’s intrinsic motivation, B = .9257, t(70) = 12.13, p = .000. These significant results fulfill the prerequisite requirements for the mediation test using the bootstrapping method with bias-corrected confidence estimates . As recommended by Preacher and Hayes , we set 95% as the value for the confidence interval and 5000 bootstrap resamples of the indirect effects. Results from the mediation analysis confirmed the mediating role of a learner’s positive emotion in the relationship between agent immediacy and a learner’s intrinsic motivation, B = .43, 95% CI [.1119, .9974]. Results also demonstrated that the correlation between agent instructional style and a learner’s intrinsic motivation becomes insignificant when controlling for a learner’s positive emotion, B = .17, t(70) = .2145, p = .1852, thus endorsing the role of positive emotion as a full mediator between an agent’s instructional style and a learner’s intrinsic motivation. Multiple regressions were conducted to assess the correlations among an agent’s instructional style, positive emotion, and multimedia learning environment perception. Results indicated significant correlations between an agent’s instructional style and perception of the multimedia learning environment, B = .9396, t(70) = 3.17, p = .0022; between an agent’s instructional style and positive emotion, B = .5816, t(70) = 2.4, p = .0185; and between positive emotion and perception of the multimedia learning environment, B = .9686, t(70) = 10.71, p = .000. Because these correlations were all significant, we then proceeded to conduct a mediation analysis (confidence interval = 95%, bootstrap resamples = 5000). Results from the mediation analysis confirmed that a learner’s positive emotion mediates the effects of an agent’s instructional style on a learner’s perception of the multimedia learning environment, B = .112, 95% CI [.0920, .9963]. Furthermore, when controlling for a learner’s positive emotion, the correlation between an agent’s instructional style and a learner’s perception of the multimedia learning environment becomes insignificant, B = .75, t(70) = 1.98, p = .0516. This suggests that a learner’s positive emotion acts as a full mediator between an agent’s instructional style and a learner’s perception of the multimedia learning environment. Multiple regression analyses were first conducted to assess the relationships among agent immediacy, positive emotion, and perception of the pedagogical agent (i.e., total scores of agent perception). Significant correlation effects were shown for relationships between an agent’s nonverbal cues and perception of the pedagogical agent, B = .6310, t(70) = 2.2, p = .031; between an agent’s instructional style and positive emotion, B = .5816, t(70) = 2.4, p = .0185; and between positive emotion and perception of the virtual agent, B = .4, t(70) = .7336, p = .000. As the variables were shown to be significantly correlated, this qualifies us to proceed to mediation analysis (confidence interval = 95%, bootstrap resamples = 5000). Results from the mediation analysis confirmed the role of positive emotion as the mediator between an agent’s instructional style and a learner’s perception of the pedagogical agent, B = 2.17, 95% CI [.0705, .9117]. When controlling for a learner’s positive emotion, an agent’s instructional style failed to have a significant direct effect on the perception of the virtual agent, B = .2043, t(70) = .86, p = .3902. Hence, this suggests that a learner’s positive emotion is a full mediator between an agent’s nonverbal cues and a learner’s perception of the pedagogical agent. To test whether positive emotion played a mediating role between an agent’s instructional style and cognitive learning (i.e., measured as total scores in post-test), we first conducted a series of regression analyses to assess the relationships between these variables. The correlation between an agent’s instructional style and cognitive learning was found to be significant, B = .2085, t(70) = 2.59, p = .0116. There was also a significant correlation between an agent’s instructional style and a learner’s positive emotion, B = .5816, t(70) = .0185. However, a learner’s positive emotion was not significantly correlated with his or her cognitive learning, B = −.01, t(70) = .0102, p = .7994. Also, when controlling for a learner’s positive emotion, the correlation between an agent’s instructional style and a learner’s cognitive learning remained significant, B = .2145, t(70) = 2.5446, p = .0132. Finally, the results from the mediation analysis (confidence interval = 95%, bootstrap resamples = 5000) discredited the mediating role of a learner’s positive emotion between an agent’s nonverbal cues and a learner’s cognitive learning, B = −.1, 95% CI [−.0703, .0406]. Taken together, we can conclude that the effects of an agent’s instructional style on a learner’s cognitive learning were not mediated by the learner’s positive emotion. Appendix (Table 4) shows the results of participants’ positive emotion, intrinsic motivation, perception of a multimedia learning environment, agent perception, cognitive load, and cognitive outcome in enthusiastic and neutral agent conditions. Figure 4 illustrates the path diagrams of the results of mediation analyses for intrinsic motivation, perception of a multimedia learning environment and agent perception. This research commenced with the question: should a pedagogical agent convey enthusiasm to learners? On the one hand, one might anticipate that the presence of an enthusiastic agent will negatively impact the cognitive, emotional and motivational aspects of multimedia learning. This prediction is based on the notion that an agent’s exaggerated behavioural cues may impose additional processing burden to the visual and mind (extraneous cognitive load, [13–16]). On the other hand, agent enthusiasm was expected to positively affect learning and motivation, due to the enhanced positive emotional responses in learners, which direct their approach behaviours (intrinsic motivation, affective perceptions, cognitive outcome) in the learning process [17–24]. To provide clarification on this issue, we compared the effects of two pedagogical agent personas, i.e., an enthusiastic agent and a neutral agent. The neutral agent was modelled after the style of a news presenter. That is, the agent’s voice was calm and pleasant and its facial expression was neutral. The enthusiastic agent had a smiling face, frequently nodded its head, demonstrated a high level of animated gestures, and spoke in an enthusiastic voice. Additionally, the enthusiastic agent conveyed its enthusiasm by remarking on the value of the learning material and expressing its own interest in the subject. Johnson et al. suggested that a pedagogical agent may convey enthusiasm for the subject matter and thereby foster similar levels of enthusiasm in the learner. This idea was empirically supported in our study—learners who interacted with the enthusiastic agent experienced higher positive emotion than learners who interacted with the neutral agent. Notably, agent enthusiasm helped the learners sustain their levels of positive emotion throughout the learning process in the multimedia learning environment (see Fig. 3). In contrast, the level of positive emotion experienced by learners who interacted with the neutral pedagogical agent dropped significantly throughout the learning process. In the context of our study, learner’s intrinsic motivation was significantly enhanced under the presence of an enthusiastic agent. Additionally, learners who interacted with an enthusiastic agent had better perceptions of the multimedia learning environment and of the pedagogical agent, than did learners who interacted with a neutral agent. These findings have important implications. First, we showed that agent enthusiasm encourages learners to increase their levels of effort during multimedia learning. Also, agent enthusiasm influences learners to have better perceptions of the multimedia learning interface and of the pedagogical agent itself, thereby encouraging them to continue using the multimedia learning system in the future. Specifically, learners in enthusiastic agent condition reported a significantly higher degree of willingness to interact with the pedagogical agent and the multimedia learning environment again in the future. Moreover, agent enthusiasm increases the social appeal of the pedagogical agent itself. Though there was no difference between the perceived credibility of each agent, learners nevertheless rated the enthusiastic agent as friendlier than the neutral agent. Importantly, our study demonstrated that cognitive outcome was positively impacted by agent enthusiasm. The magnitude of the differences in the cognitive outcome means (d = .09) was between moderate to high . However, contrary to emotional response prediction [17, 18], the cognitive effects were not mediated by a learner’s positive emotion. Hence, the arousal hypothesis  and emotion as cognitive adapter hypothesis  were not supported in this study. This finding indicates that the verbal and nonverbal cues of agent enthusiasm has a more direct effect on cognitive outcomes. However, the data of our experiment did demonstrated the roles of positive emotions as full mediators to perceptions of learning environment, perceptions of agent, and intrinsic motivation. This observation showed that a learner’s positive emotions were affected by the agent’s enthusiastic verbal and nonverbal cues, such as smiling facial expression, highly animated gestures, enthusiastic vocal tones, and remarks indicative of interests towards the subject, which then enact approach behaviours in the learning process, particularly in terms of affective perceptions and motivations. Hence, the theoretical framework of emotional response that has been established in conventional classroom settings [17–19], was also shown to be relevant in the context of affective and motivational aspects of learner-agent interaction in a multimedia learning environment. For future works, other agent behaviours, such as empathy, verbal encouragement, and humour, can be also researched in relation to learners’ emotional states. Moreover, psychological aspects of agent design, such as gender, pedagogical roles (e.g., companion vs. mentor), visual style (e.g., realism vs. baby-faced design), stereotypes, and similarity-attraction, can potentially affect a learner’s emotional state, which in turn, may impact affective and motivational aspects of learning. The results of our experiment did not indicate any association between agent enthusiasm and extraneous cognitive load. There were also no indications of emotional and perception discomforts experienced by learners who interacted with the enthusiastic agent. Our data demonstrated that agent enthusiasm had a positive, rather than a negative, impact on learner’s emotion. Similarly, learners in enthusiastic agent condition gave significantly higher ratings for agent perceptions than did learners in neutral agent condition. Notably, our data showed that agent enthusiasm enhances, rather than impairs, cognitive outcome. Taken together, our study did not support the agent enthusiasm as cognitive and emotional distractor hypothesis. Should pedagogical agents convey enthusiasm? Our study preliminary demonstrates the benefits of agent enthusiasm on cognitive, emotional and motivational aspects of multimedia learning. Does agent enthusiasm distract learning? The results of our study showed that agent enthusiasm did not impose additional cognitive load during multimedia learning, despite the fact that our enthusiastic agent exhibited “seductive” details such as superfluous dialogues and exaggerated nonverbal cues, i.e., vocal tones, facial expressions, and gestures. Moreover, the motivational and emotional states of learners were not decreased by agent enthusiasm; hence, there was no evidence of uncanny valley effect. In the context of our study, the hypothesis that agent enthusiasm will distract learning was not supported in this study. The fact that an agent’s verbal and nonverbal cues significantly influenced a learner’s emotion, intrinsic motivation, perceptions of the virtual learning environment, perceptions of the pedagogical agent, and cognitive learning has important theoretical and practical implications for agent design. Through the lens of the emotional response framework, we demonstrated the full mediating role of positive emotion in affecting learners’ approach–avoidance behaviours, such as intrinsic motivation, perception of the virtual learning environment, and perception of the pedagogical agent. Hence, our data provides an empirical contribution, related to pedagogical agent design, to the emerging literature related to emotional factors in the virtual learning environment [29, 48, 54, 55]. In terms of agent design, the importance of the verbal and nonverbal design of a pedagogical agent is highlighted. However, it should be noted that the design of verbal and nonverbal cues of pedagogical agent should be carefully developed to ensure proper matching of vocal tone and facial expression, in order to elicit the desired emotional and motivational outcome from learners . From the practical viewpoint, our study showed that an agent enthusiasm can be formulated via the operation of the agent’s voice and animation gestures. It should be noted that the voices of the agents in our study were recorded by professional voice actors. In the future, the nascent text-to-speech and animation technologies may allow for real-time artificial expressions of agent emotional cues, via immediate controls of voice tones, facial expressions, and animation gestures of a pedagogical agent. These promising development opens a myriad of exciting potential benefits (and questions) regarding the socio-emotive and cognitive aspects of learner-agent interaction. At this juncture, we would like to highlight three limitations of this study and corresponding suggestions for future research. The first limitation pertains to the short duration of the multimedia learning environment (20 min). Though agent enthusiasm was shown to sustain a learner’s positive emotion throughout the short duration, the effects of repeated and prolonged agent enthusiasm is not known. Would agent enthusiasm still be “contagious” for a longer period of time? Or would prolonged agent enthusiasm translates to cognitive and emotional distractions during multimedia learning? These questions clearly warrant future studies. The second limitation of this study pertains to the control of learner’s prior knowledge. In our experiment, we ascertained that our samples were novice learners (i.e., they did not have prior knowledge regarding subject domain). Hence, the moderating effects of prior knowledge were not explored in our study. Literature has shown that seductive details in multimedia learning interfaces differently affect novice and expert learners [54, 56]. In a similar vein, it is plausible that learners with high prior knowledge will be differently affected by agent enthusiasm in a multimedia learning environment. Hence, follow-up studies should be conducted to shed more light on this issue. The third limitation relates to the design parameters of which agent enthusiasm was operationalized. In the context of this study, vocal tones, facial expressions, dialogues, and head gestures were manipulated, based on lists of verbal and nonverbal cues found in literature regarding teacher enthusiasm [20–25] and emotional response theory [17–19]. Specifically, the operationalization of agent instructional style (enthusiastic versus neutral) was a combination of these various parameters. Hence, effectively, we are not able to tease apart the parameter(s) or confounding parameters that have produced the results of this study. This issue poses a conundrum that future research should investigate. TWL, NAMZ and NSA contributed to the conception and design of the study. TWL was involved in the acquisition of data, data analysis, and data interpretation. NAMZ and NSA provided critical intellectual supervision and revision of this research project and the drafting of this manuscript. All authors read and approved the final manuscript. This research has been supported by the Fundamental Research Grant Scheme by Malaysia Ministry of Higher Education under Grant Agreement ID: MMU/RMC-PL/SL/FRGS/2014/1.